The strange city of Carrion Hill has long loomed over the surrounding swamps in eastern Ustalav, yet its rulers have shifted many times through the centuries. Often enough that only a few sinister scholars and curios minds know the true nature of the hill's original inhabitants - vile and depraved cultists of the Old Gods. Yet this morning a dreadful recrudescence rises from the depths of the buried nightmare in the vaults below Carrion Hill. A monster stalks the twisted alley of the city, spreading panic before it and leaving destruction in its wake. Can the Carrion Hill Horror be stopped? 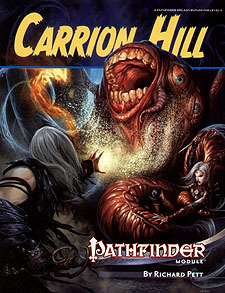 Carrion Hill is an adventure for 5th-level characters, written for the Pathfinder Roleplaying Game and compatible with the 3.5 edition of the world's oldest RPG. The adventure features a mix of urban and dungeon sites, and draws its inspiration from the popular writings of HP Lovecraft.